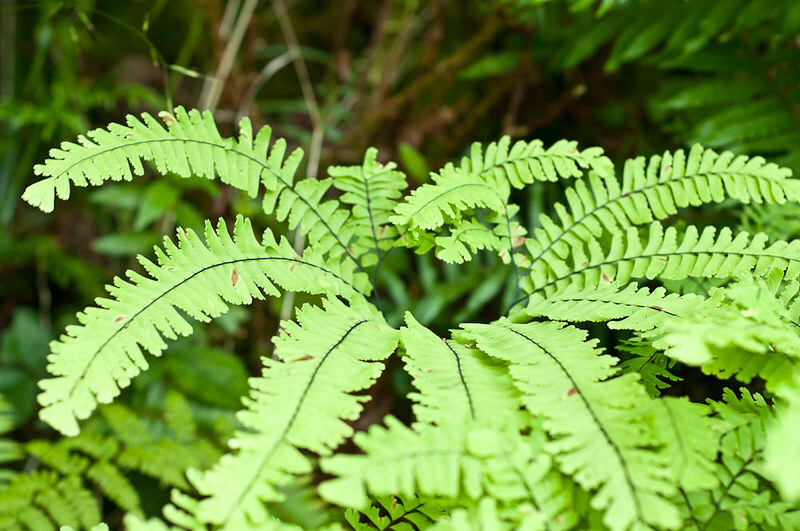 It's called Maidenhair Fern, or Adiatum pedatum. I like the black stipe, and the way the fronds radiate from the main stem. I also like the softness of the fronds, and their green. This one gives you an idea of how it radiates. I don't think the pictures do it justice, of course. This is part of a stand. The trail was pretty narrow, so it wasn't possible to back up far enough to get a good over all view. I don't recall having seen this in Seattle parks before. I could well have missed it, and just noticed it now. It grows in climates similar to North Beach, so it can grow there if it isn't already. But what are you doing posting on line? Don't tell me your campground has wifi. It was a short trip -- we're back already. We left Sunday morning, got to Salt Creek in time enough to look at the tide pools some and explore the bunkers in the park (it's a decommissioned WWII gun emplacement), and then spent all day Monday with more tidepools and a hike that Julie's Journey Tracker (app) said was about nine miles, but the guide books say is about five miles. It was beautiful, that's where we saw the maidenhair ferns. It would do well in North Beach Park if it isn't there already.